Size: 3 7/8 in x 3 7/8 in x 1/8 thick. Item Type: Glass drink coasters with stand. 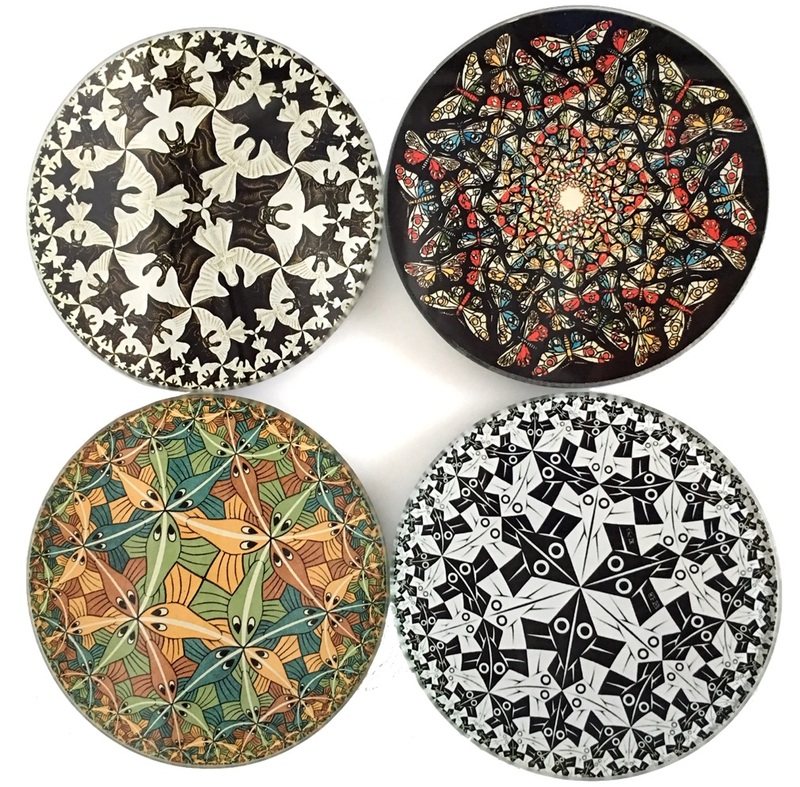 Decorate your coffee table with glass drink bar coasters of Tessellations Geometric Drawings by Artist Maurits Cornelis Escher. 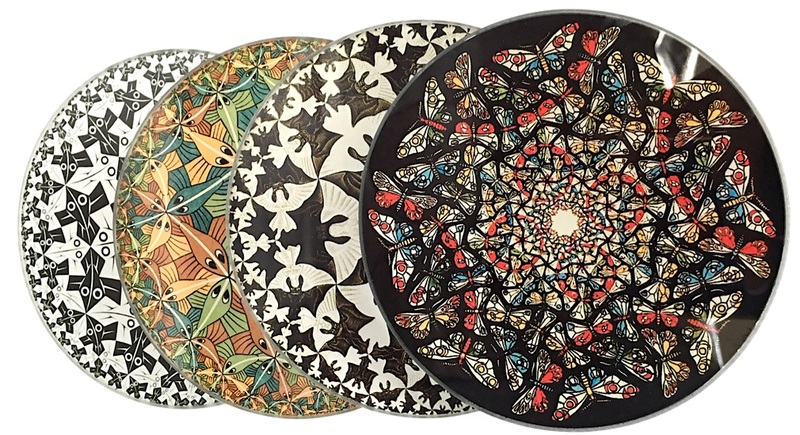 Each drink coaster shows a different painting from Escher's oeuvre -- Fish in green orange red blue, Butterflies, Birds black and white, and Bats and Angels. Part of the Parastone Museum Gift Collection of European designed gifts inspired by the beauty of art through the ages. Each set has four different paintings about an artist or theme. 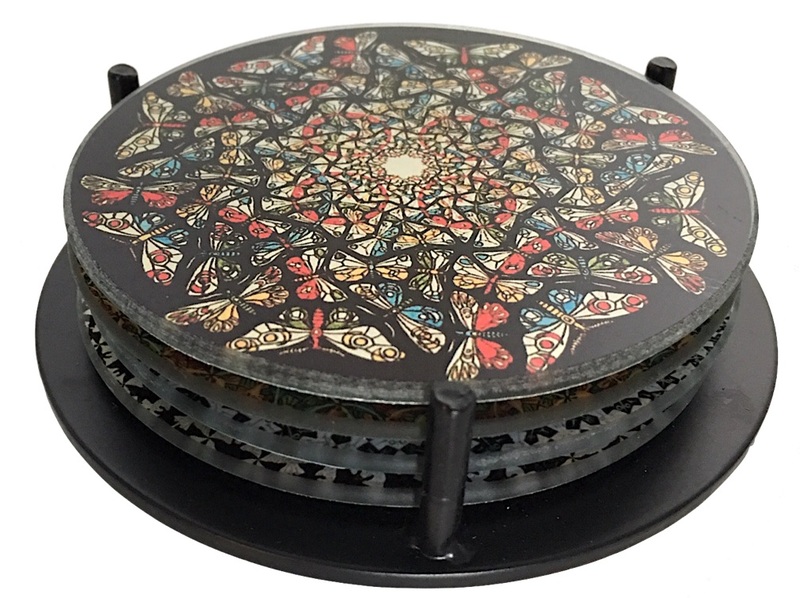 Each round glass coaster measures 3 7/8 inches x 3 7/8 inches x 1/8 inch thick. Weighs 1.2 lbs for the set. PN CS14ESC. Bottom has four rubber feet to protect your table and prevent slipping. Comes with a metal storage rack as pictured. Maurits Cornelis Escher (1898-1972): Escher initially pursued a career in architecture, but his passion for graphic arts soon changed his mind. He was taught the principles of graphic art by S. Jessurun de Mesquit in the Dutch town of Haarlem. After 1936, his realistic style and subject matter changed profoundly, when he drew the first of his famous ‘impossible realities’. During the rest of his life, Escher devoted himself to graphic art and the incorporation of transcendental ideas, such as metamorphosis and infinity, within the world of mathematics.